Use and find the keyboard shortcuts. It’s demo time! Maria’s hard work has paid off and she’s ready to show off the new agent productivity tools to Sita, Roberto, and some all-star agents. Maria sets up a fake case so she can demo all the tools at once. Instead of working from a list view, Maria wants to show the power of split view. She starts her demo from a closed case. 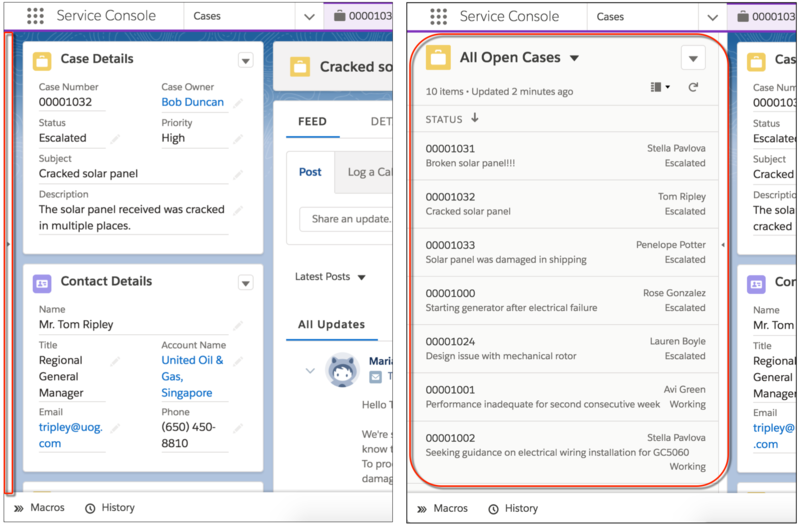 Instead of navigating back to a list view to open another case, she shows how easy it is to open a case from split view instead. To open and close split view, click the vertical bar at the very left of the console. Now it’s time to demo the macro she created. 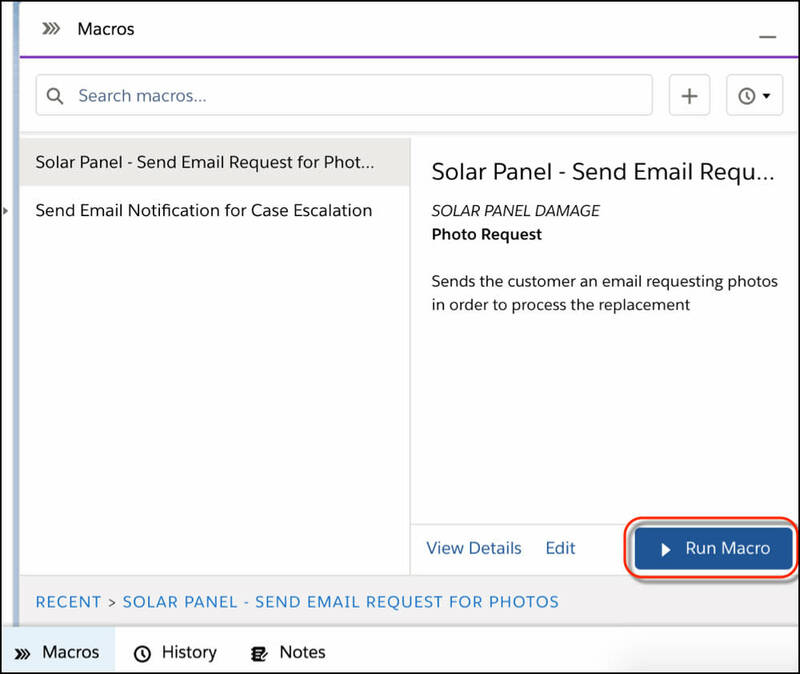 This macro sends an email to the customer requesting photos of the damage in order to process the replacement. She opens a case that doesn’t have any customer photos. Open a case you want to work with. If you’re following along, update the email address for the case’s contact to your own. That way when you send the email, you can see it yourself. Click Macro in the utility bar. Select the macro you want to run. The macro runs on the open case record. In preparation for quick text, Maria wants to highlight where agents can find other keyboard shortcuts. 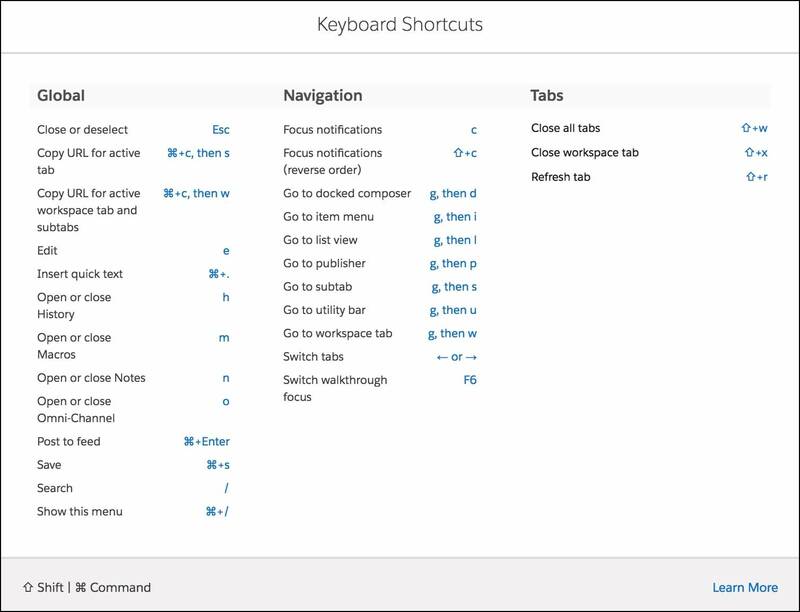 To open the keyboard shortcuts panel, open the help menu and click View Keyboard Shortcuts. You can also use a shortcut to view the menu. Enter Cmd+/ on MacOS and Ctrl+/ on Windows. While Maria was showing off the available shortcuts, the customer has demo-magically responded. The case was updated with a photo and Maria verifies it. Now it’s time to send along another email confirming the replacement and verifying the customer’s address. Maria demos how quick text can help with emails too. 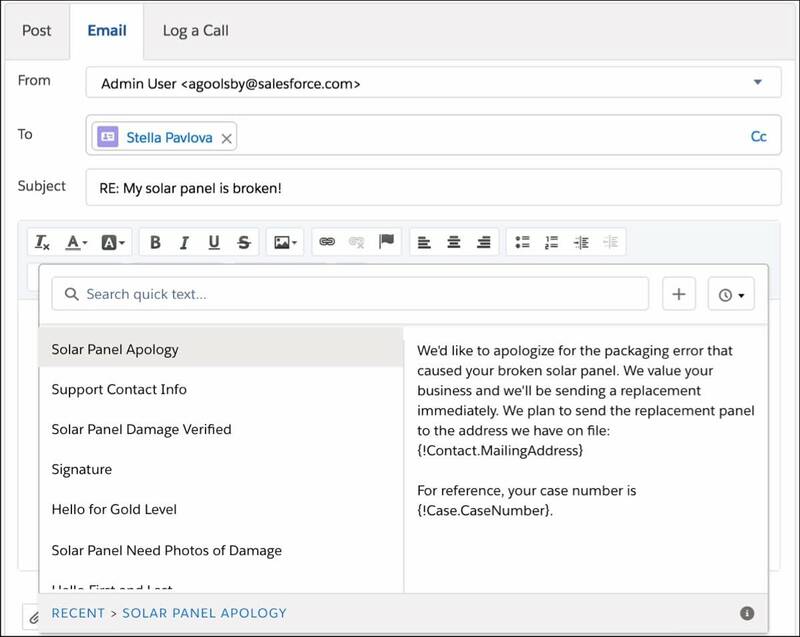 Demo Double Bonus: She gets to also demo how the Email action is prepopulated with an email template! If you didn’t customize the Email action with a predefined email template, you can still follow along. If you want to go back and customize your action, head back over to Unit 2. Place your cursor in the middle of the prepopulated email body. To insert quick text, you can use a button or a keyboard shortcut. Select the quick text you want to enter. Now it’s time to reassign the cases so the next agent can process the replacements. Maria wants to show off mass quick actions. She heads over to the case list view. Keep in mind that mass quick actions don’t work on the Recently Viewed list. Here’s what Maria does on the My Open Cases list view. Select the cases you want to perform mass quick action on. Fill out the action details. Select a new owner. If you don’t have any other users in your org, you can leave yourself as the owner. Set the status to Escalated. Enter Ready for new solar panels in the Internal Comments field. Review your changes in the Fields to update section. Click Save. Then click OK to perform the action. Last on the demo is the History utility. Maria’s been working with a lot of records and she wants to show her team how agents can find a list of the records they’ve visited. To open the utility, press H on your keyboard or click History in the utility bar. If you opened any subtabs, they’re listed in context of the workspace tab. 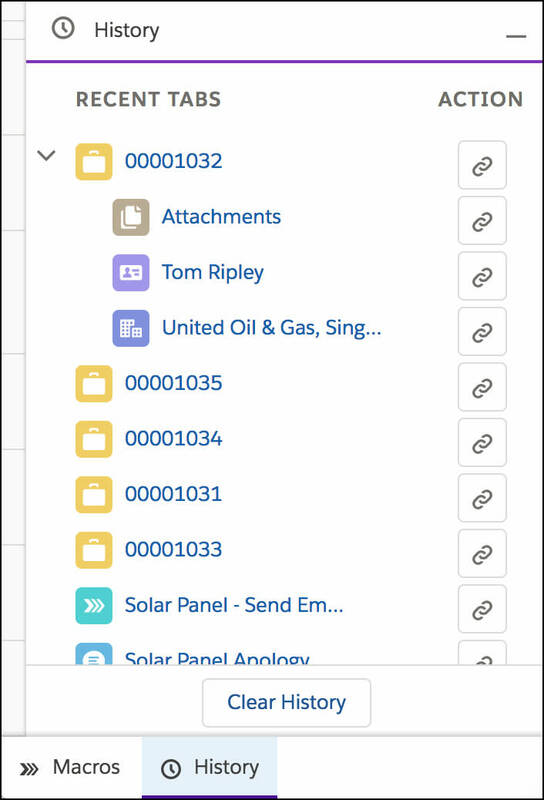 You can also copy links for records in one click. Here are a couple more tools that Maria plans to look into. Apex QuickActionDefaultsHandler interface Use this Apex interface to override email field values based on complex logic. 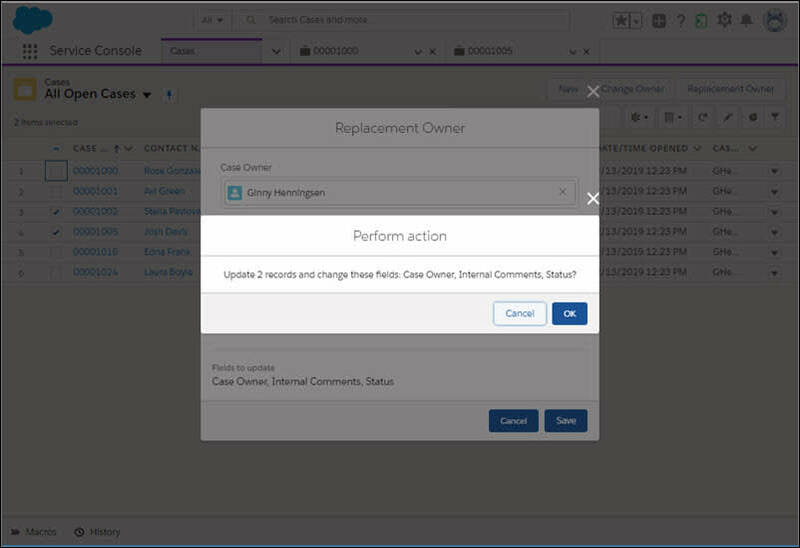 For example, you can use this Apex interface to apply a specific email template and BCC a manager on only high-priority cases. 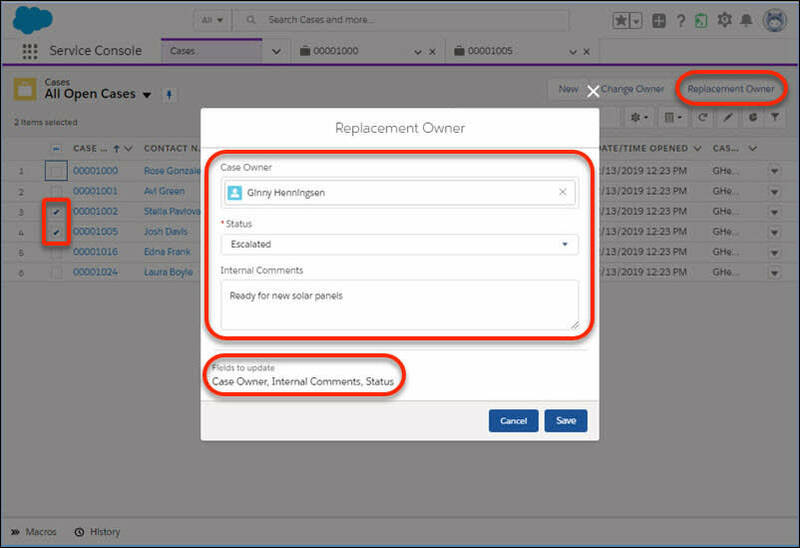 Email defaults set with this Apex interface override all other defaults, including a quick action’s predefined email template and predefined field values. 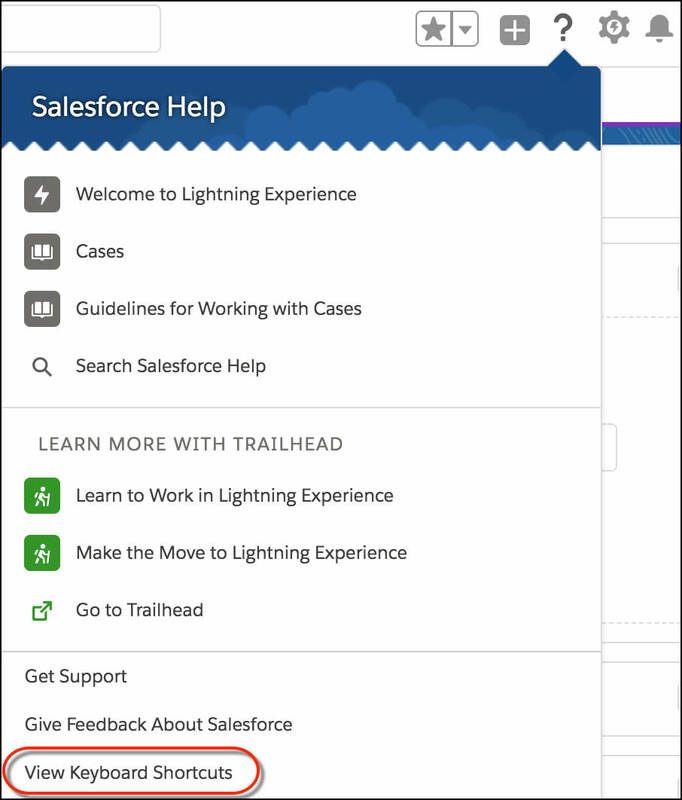 Lightning Flow for Service Guide your users through multistep processes with Lightning Flow for Service, and associate records to flows using Salesforce automation tools. When a record that has an associated flow is opened in a console app, the flow is launched as a subtab. You can configure default flows for specific channels, like phone and chat, and specify which flows you want users to complete first and last. Looks like there are always more ways to increase agent productivity. Maria’s excited to implement more time-saving tools for Ursa Major Solar in the future.